Almost all embedded devices are designed to interact with the real world. They act as a bridge to communicate between the digital world and the real world. To make this process easier and efficient, the digital world would sometimes need to keep track of the time of and date of the real world. This way the digital world will know what time/day it is in the real world and can even distinguish between day or night time. It can also act as a time source to perform certain tasks at a specified time or date. So here we are interfacing a RTC module with PIC Microcontrollerand display the time and date on the 16×2 LCD. 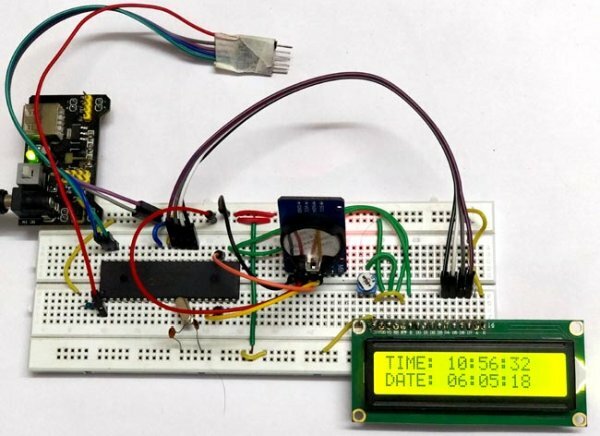 This project can also be used as Digital Clock. 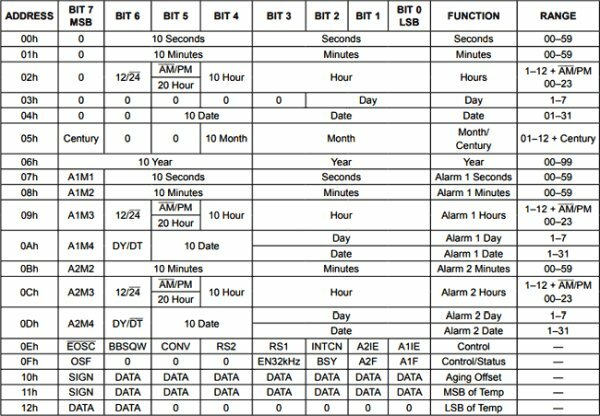 The most common way for a microcontroller to keep track of the real worlds time or date is by using an RTC IC. The term RTC stands for Real Time Clock; this IC keeps track of the real world time and date and would share this information with the microcontroller whenever requested. 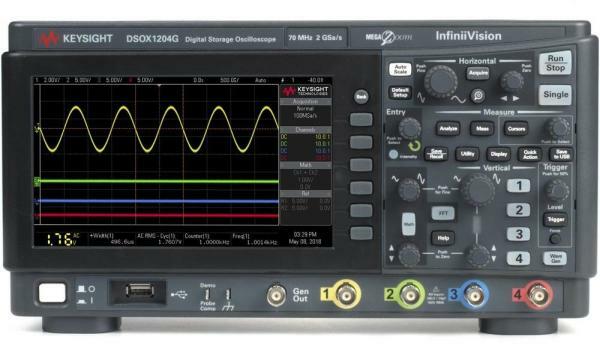 The RTC IC that we are using here is the most popular and accurate DS3231. This IC drifts only by few seconds each year and hence is highly reliable. For the sake of this tutorial we are using the DS3231 RTC module which can be easily purchased online or from the local hardware shop. The module comes with a 3V coin cell which powers the RTC module always and hence once the time and date is set it will be updated as long as the coin cell is alive. The DS3231 module communicates with the help of I2C protocol, so if you are not aware of what it is and how it is used with PIC read the I2C with PIC tutorial before proceeding. 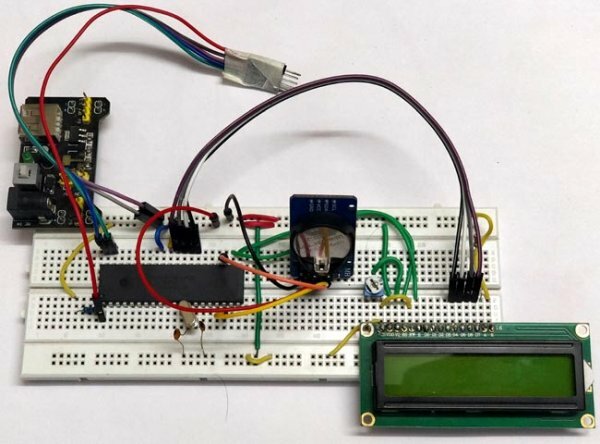 Also in this tutorial we are going to create a header file which can be used to communicate with our RTC module and also test the same on hardware by displaying the time and date on a LCD display so it is also important to learn how to interface LCD display with PIC microcontroller. The header file created in this tutorial for DS3231 can later be used/modified to suit your applications. Circuit diagram for PIC Microcontroller based Digital Clock is given below. As told earlier the DS3231 works with the help of I2C communication so it will have a Serial Clock (SCL) and a Serial Data (SDA) pin which has to be connected to the I2C pins on our PIC which is the pin 18(SCL) and pin 23 (SDA). A pull up resistor of value 4.7k is used to keep the bus at high state when idle. An LCD display is also connected to the pins on Port D to display the current date and time. The complete circuit diagram was designed on proteus and is shown below. We are going to use the same to simulate or program later in this tutorial. Follow the circuit diagram and make the connections accordingly, the I2C box shown above is used for I2C debugging so we will not include that in our connections. Also it is not shown that the RTC module has to be powered with a +5V supply using the Vcc and Ground pins on the module. I used my breadboard to make the connection and after making the required connections my set-up looked something like this below. The complete program for this Digital clock can be downloaded from the ZIP file here. The program includes three header files altogether. They are the lcd.h file for working with LCD display, the PIC16F877a_I2C.h file for working with I2C communication with PIC and finally the PIC16F877a_DS3231.h file to work with RTC modules. All the three header files are required for this program and are available in the ZIP file above. Further below I will explain the main program which uses all these header file to read the time and date from the RTC module and display it on the LCD screen. After that I will explain what actually is happening inside the RTC header file. As always begin the program by setting up the configuration bits and setting the clock frequency as 20MHz since that is what we have used in our hardware. The next step would be to define the LCD pins, if you look at the hardware you can notice that we have connected the pins of LCD to PORT D from RD2 to RD7, so we define the same as shown below. Next we add all the header files that we discussed about. If you have downloaded and opened the program from the ZIP file then it will not be a problem else make sure all the header files are added to your source file or your project directory. 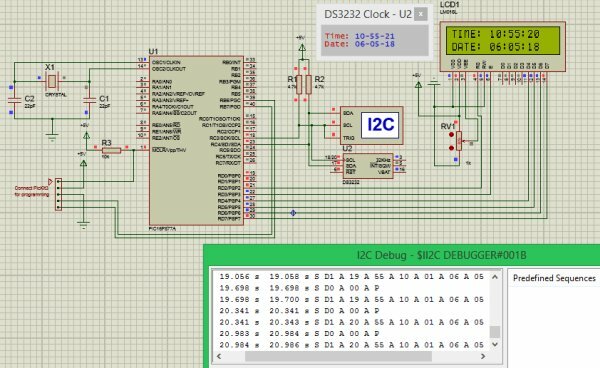 As soon as we have established an I2C communication with the RTC module the first thing we do is set the current time and date that we entered in our program. This can be done by calling the set_Time_Date function as shown below. Once the time and date is set the module will automatically keep track of it and increment them just like a digital clock. Inside our infinite while loop we should read the current time and date and then display the values in our LCD screen. To read the Time and Date from the RTC module the Update_Current_Time_Date function can be used as shown below. This function will read the value form the RTC module and update the variables sec, min, hour, date, month and year with the current values. Then we can use them for our purpose. The variables are of integer data type, we have to convert them to individual characters so that we can display them on the LCD screen. So we use the modulus operator to get the once digit and divide the variable by 10 to get the tens digit. The same is done for all the variables. All that is left to do is displaying the information that we acquired in the LCD screen. This can be easily done with the LCD functions that we have previously discussed on our LCD tutorial. So the code to display time is given below, the same method is used to display the date as well. A delay of 500 ms is given after displaying the data so that it acts as an update interval. 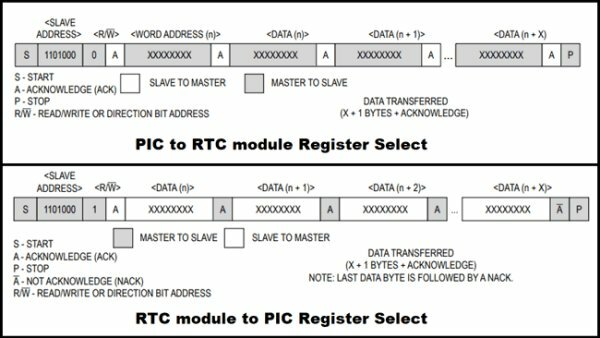 Things explained so far is sufficient to use the DS3231 module with PIC for your own projects, but for the curious minds out there would like to know what actually happens inside the header file and the data is actually received from the RTC module by PIC, just read further. When the PIC sends the address D0 or D1 either to write or read, the following data should read or written in an order. This order is shown in the table below. So the first data will be sec (00h) followed by minutes (01h) followed by hours (02h) followed by day (03h) and upto MSB of Temperature. The RTC module does not understand Decimal values, it communicates only through BCD values. So before writing any values to RTC module it should be converted to BCD and also the values received from the RTC module will be in BCD format and it should be convert to Decimal to make sense for us. With this in mind lets create all the function required for the using the RTC module. This function will write the value of time and date from the PIC to RTC module. The values of real time and date has to be updated in the variables sec, min, hour, date, month and year by the user. These values will then be converted into BCD and written to the RTC module. As we discussed, to write a value to RTC module we have to pass the address D0 and write a bull bit 0 to initiate the writing process. Then we can send the data in the order as shown in the table above. The last function in the library is the one used to read the time and date from the RTC module and pass it on to the PIC microcontroller. This function is split into three segments, one to initiate the reading process the second to read the values and save it to the global variables like sec, min, hour, date, month and year. And the third is to acknowledge that the reading was successful. Notice that for each action the I2C communication should be started and ended. To read the values from RTC we have to send the address D0 followed by a 0. This will make the RTC module send all the values it has in the order shown in table above. We can just read them convert them to Decimal and save it to the variables in the same order. Finally, after the reading is done the RTC module will send an acknowledgment bit which should also be read and acknowledged. The project can be simulated using the Proteus simulation software. Make the connections as shown in the circuit diagram and load the hex file in to the PIC controller. When you simulate it you will find two pop-up boxes and the date and time displayed on the LCD as shown below. The small one on the top shows the time and date that is current inside the RTC module and the second pop-up is the I2C debugger. It is an excellent tool to check what data is actually being passed in and out the I2C bug. Once your hardware is ready and the code is downloaded as ZIP file through the link given open the program using the MPLABX IDE. You have to launch the IDE first and use the open project option and browse to the contents inside the ZIP file and open the .X folder. Simply check if the program is compiling and upload the code into your hardware by using the PicKit3. As soon as the program is uploaded you should see the introductory message and then the time and date should be displayed as shown below. If there is nothing on the LCD check your connections and make sure the contrast level is set correctly by varying the potentiometer. That is it how you can show time and date to all your PIC microcontroller projects and can use this as Digital Clock. Hope you learnt something new and enjoyed learning this tutorial. If you have faced any problem post them on the comments below or on the forums for technical help.